Notejoy offers a deep integration with Slack, the #1 team messaging app. Slack and Notejoy work seamlessly together, allowing you to take advantage of best-of-breed tools for communication & collaboration to make it truly effortless to capture, share, and discuss your team's work. Get started by connecting Slack in Slack Settings. 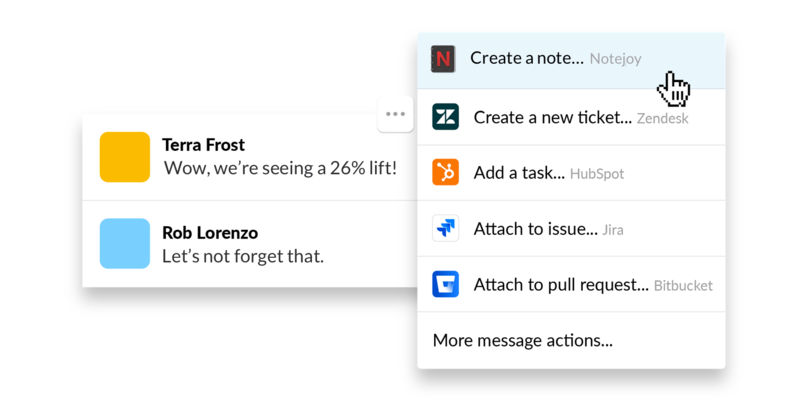 Whenever someone likes, reacts, comments, mentions, or pins your notes, you'll now receive a notification from the notejoy bot as a direct message in Slack. 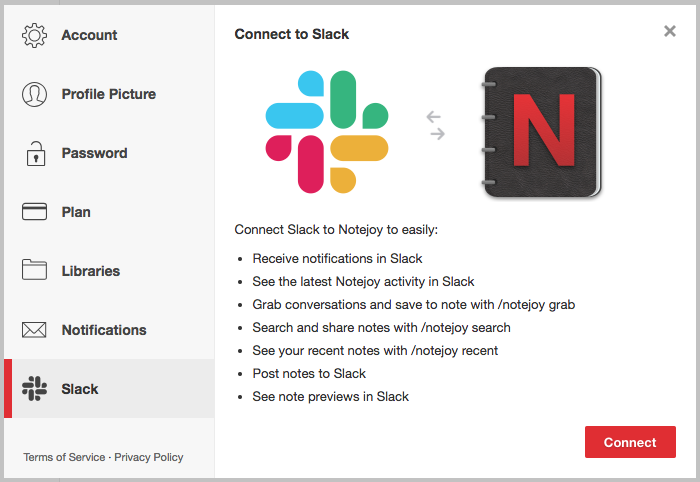 It's a great way to stay up-to-date on what's happening on Notejoy in the Slack app you're already living in. You can also configure precisely which Notejoy notifications you want to receive across each of our supported notification channels (Email, Slack, Desktop, and Mobile) in Settings. You can now help your whole team to stay on top of activity in Notejoy with Slack Activity Updates. Activity Updates allow you to automatically post activity from a Notejoy library or notebook to a Slack channel. You can set the frequency to real-time updates so that all likes, reactions, comments, mentions, and pins are automatically posted to a channel. Or you can set the frequency to daily or weekly highlights to just have the newest and most popular notes from the previous day or week posted to a channel. You can configure each of the rules for what activity updates get shared to Slack channels from Settings. Please note: activity updates can only be posted to public Slack channels. We often find that a Slack message is the perfect beginning to a note in Notejoy. Maybe it's information you need to save for later. Or a source of inspiration that needs to be fleshed out. You can now do that easily with the Create a note Slack action. We've all been there when a Slack conversation should really be captured for longevity. We've made that easier than ever with the new /notejoy grab command. Just type "/notejoy grab" in any channel and it'll automatically create a new note with the last 10 messages saved. You can specify the number of messages to grab by instead typing "/notejoy grab 25". After running the command, you'll get a chance to specify which notebook you'd like to add the note to as well as whether you want to post the new note to the channel. Sometimes you want to share a Notejoy note with folks in a channel. We've made it super quick to search for and share that note all within Slack. Just type "/notejoy search " and you'll see the top 5 search results for your search term within Slack. You can then select one to post to the channel. Similarly you may want to share a note that you just finished editing in a channel. Just type "/notejoy recent" and you'll see the 5 most recent notes that you edited and then with one click you can post it to the channel. You can now quickly post any note in Notejoy to a Slack channel. Click the share icon in the top-right corner of a note in Notejoy and select Post to Slack. You'll be able to specify the channel and an optional message and then the note will be immediately posted to the channel. Now whenever you share a Notejoy note url within Slack, it will be automatically expanded into a rich note preview, showcasing the note's title, preview, authors, image, location, and date. It's never been easier for channel members to know exactly what your note is all about. Previews are generated for any notebook or library urls you share within Slack as well.